Monday the 25th of February was an historic moment for Cornish sport. 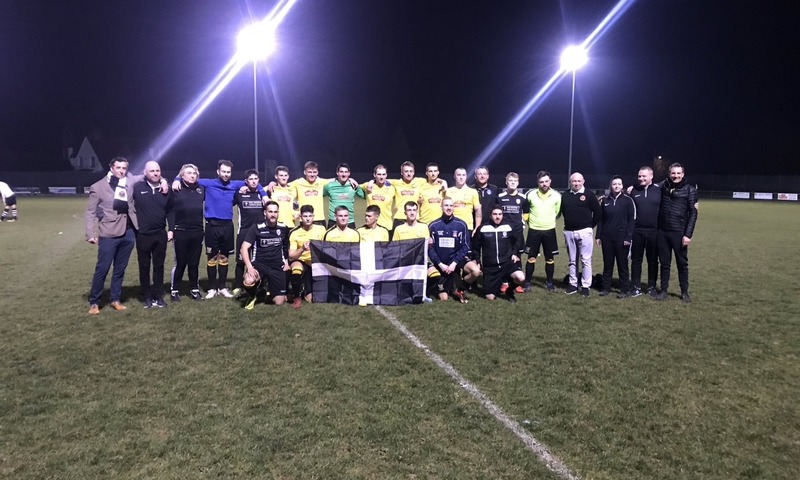 The newly-formed Kernow Football Alliance, comprised of local players across a number of clubs in Cornwall, played their first ever fixture as the Duchy’s national team. They took on a Foxhole Stars XI at Poltair Park in St. Austell and emerged victorious thanks to goals from Harry Clarke, Olly Brokenshire and Liam Eddy. However, truth be told, the day was not about the result but about the pride of seeing the beginnings of a project which reflects the unique pride of people towards local sport in Cornwall. The Kernow FA are looking to represent Cornwall as a nation at the 2020 CONIFA World Cup where states and regions not affiliated with FIFA can compete on a global platform. The local interest is immense and this is reflected by listening figures on BBC Radio Cornwall’s sports show which against the national average, continue to grow. For example, playing in the South West Penninsula League Premier Division, St. Austell hold an average attendance of 236 this season which may not sound a lot, but considering this is the tenth-tier of English football reflects that the interest is in the football, not the level. Similar standard teams in other parts of the country often see attendances under 20, for comparison. Attendances in the rugby are even stronger with Redruth averaging 774 in the 2017/18 season and the Cornish Pirates averaging 1,520 as Cornwall’s association with the game fails to falter. Simply put, there is a genuine uniqueness to the passion and pride held by those in the Duchy towards local sport that is hard to imagine being paralleled elsewhere in the country and as evidenced with the Cornwall Rugby team, the pride of representing the county is one that local sportspeople dream of. A while ago, I interviewed Cornish Pirates player Sam Matavesi who has recently returned to the Fiji national team setup and he told me that despite being scouted by a number of Premiership teams, if he could then he would jump at the chance of playing for the Cornwall team. “Cornwall has a tradition for sport and particularly rugby which is still evident today when young players relish the chance to pull on the black and gold shirt and play for their county. “The pride the players show and the support from their family is still immense. The present Under-20 county data base shows 60 players who want to play. and already that group have recorded two standout wins against Devon and Hampshire. It’s not just at local level however, where there has been immense success. There have been terrific recent successes at the top-level with Jack Stephens of Torpoint establishing himself as a Premier League centre-back with Southampton and in the rugby, Newlyn’s Jack Nowell becoming an elite player with Exeter Chiefs and England and the Matavesi brothers breaking into the Fiji setup. Better still, the Stadium for Cornwall offers to be the next level for the county’s flagship rugby club in the Cornish Pirates and the most senior football club in Truro City with a capacity of 4,500, expandable up to 10,000. The world of athletics has also seen the likes of Ben Ainslie, Helen Glover and Ed Coode win gold medals at the Olympic Games and with upcoming talent like pole-vaulter Molly Caudery, the future seems bright.